The specialists in the Crime Victims Unit are ready and able to help victims throughout the criminal justice process. They can explain a victim’s rights, how the court system works and what to expect each step of the way. They are available to meet with victims in person or to speak with them over the phone. The specialists can make sure that a victim’s thoughts are directly conveyed to the Assistant District Attorney handling the case. Additionally, the specialists can explain the possibility of reimbursement from the New York State Crime Victims Board and help with the application process. Information about and referral to other available services is also provided through this unit. You can contact the specialists at (518) 885-2263. To learn more about who the crime victim specialists are in the Saratoga County DA’s office Click Here. 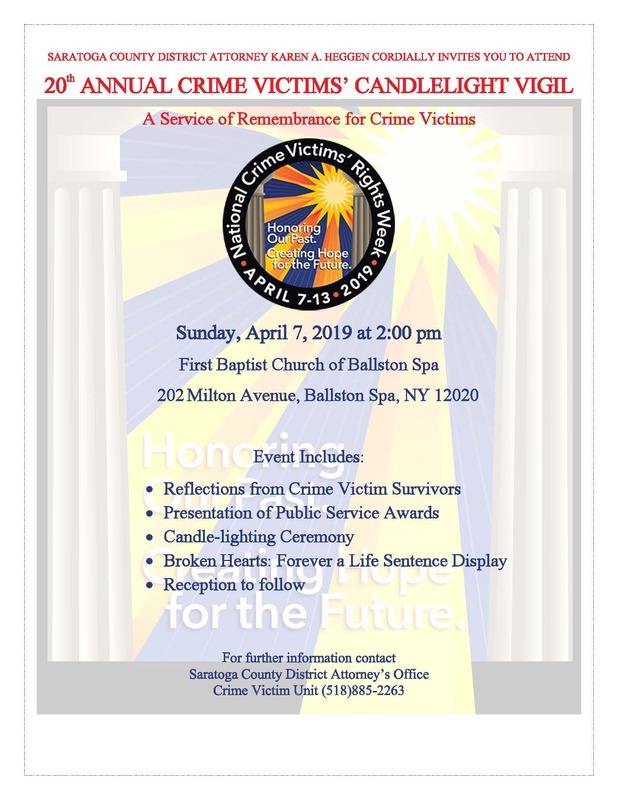 An annual event which the Crime Victim Unit sponsors is the Candlelight Vigil for Crime Victims held during National Crime Victims’ Rights Week in April each year. This vigil is an opportunity for victims, their families and friends to come together to share their stories and experiences with the community. This event is open to the community and all are welcome. This year, as in past years, the vigil was held at the Presbyterian New England Congregational Church on Circular Street in Saratoga Springs, NY. The Candlelight Vigil allows us to recommit and rededicate ourselves and our offices to the rights of victims and to reaffirm our dedication to providing victims’ services. A committee of volunteers from our community and the capital district work very hard to organize the candlelight vigil which is the first event of crime victims’ rights week. Each year the vigil is organized around a victims’ rights theme and is attended by nearly 100 people. During the ceremony, victims speak and tell those assembled their story. Each victim’s experience is unique and compelling. 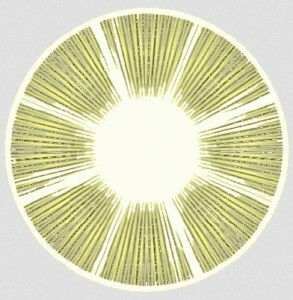 In addition, many hard working individuals are recognized. 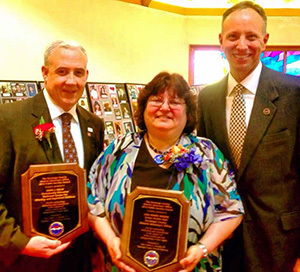 The district attorney selects a special person who has demonstrated a commitment to helping victims and honors him or her with the DA’s Public Service award. 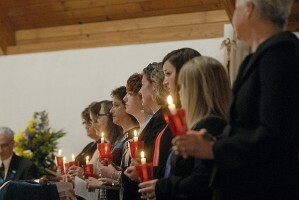 Many individuals and organizations participate in the vigil including The Kathleen A. Campion Foundation, The Prevention Council, The Saratoga Center for the Family, Mother’s Against Drunk Driving, the FBI, the New York State Crime Victim’s Board, the Department of Parole, the Department of Corrections, the Saratoga County Board of Supervisors, the District Attorney’s Office Crime Victim Unit, the Saratoga County Probation Department, the Presbyterian New England Congregational Church, other churches and synagogues, the Division of Criminal Justice Services, local and county police agencies, local, county and state elected officials, and victims and their families. We thank all of them for making the vigil a success each year. The Innocent Ones was written and sung by Jesse Ashdown and his brother David Ashdown. It was created for the Saratoga County Crimes Victims Rights Week Candlelight Vigil in 2005. In was recorded and produced by Gallileo Productions, John Wager and Laurie Murphy with funds provided by former District Attorney Jim Murphy. 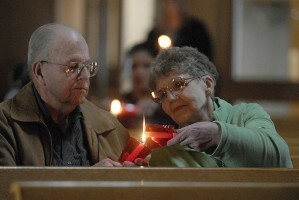 Herbert Smith lights his wife Carol’s candle in remembrance of their late son, Glenn. Candles are lit in remembrance of crime victims. 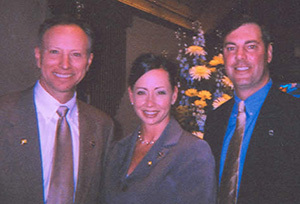 John Kelly, former Saratoga Springs Police Department and National Center for Missing and Exploited Children. Lisa Hogan: Saratoga County District Attorney’s Office Crime Victim Unit. Lisa Chamberlain: Youth Court Coordinator, Prevention Council. 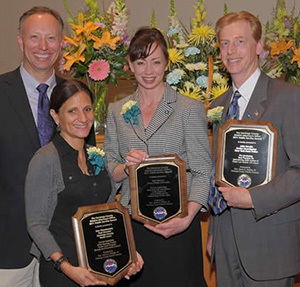 Erin Pierone: Saratoga County District Attorney’s Office Crime Victim Specialist. John Brooks: Senior Investigator, New York State Police, Bureau of Criminal Investigation. Lisa Bensinger, a Certified Victim Advocate for MADD decided to become an advocate after losing her high school friend to a 5 time repeat offender. Ed Belles, a 35 year veteran with the New York State Police retiring with the rank of First Sergeant of Troop G Headquarters joined the staff as Law Enforcement Coordinator at the Harriet M. West Child Advocacy Center. 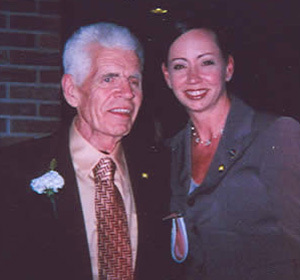 Crime Victim Specialist Erin Pierone with Don Miles, who spoke on behalf of the family of David Bacon, a homicide victim in Saratoga County from a murder that occurred in Waterford in 1969. 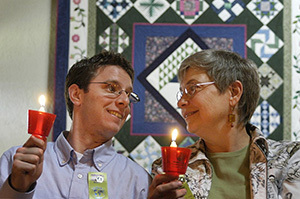 Karen Pettigrew of MADD and Jonathan Mueller, a DWI Survivor, at the Candlelight Vigil in 2008, share a happy moment as Crime Victims’ Right’s Week begins.